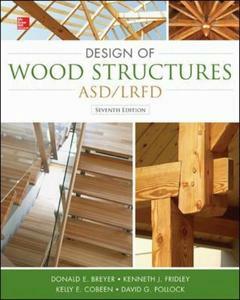 Design of Wood Structures-ASD/LRFD BREYER Donald E.
Auteur : BREYER Donald E.
Connection design'including the overall typing together of the vertical- and lateral-force-resisting systems. Conforms to the 2012 International Building Code (IBC). Addresses new 2011 National Design Standard (NDS) provisions. Combines dual-format Allowable Stress Design/Load Resistance Factor Design (ASD/LRFD). specification, equations, and problems throughout. Includes the 2010/2011 ASCE-7 Standard Instructor's Manual.